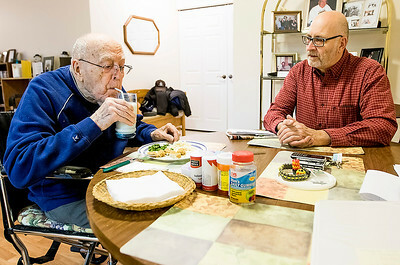 Sarah Nader- snader@shawmedia.com Bob Maronda (left) visits with his father, Bob Maronda, and his fathers caregiver Terry Copack while he dad eats dinner at his Crystal Lake home Wednesday, March 18, 2015. With the help of family and caregivers Maronda takes care of his 90-year-old father who has parkinson’s disease. 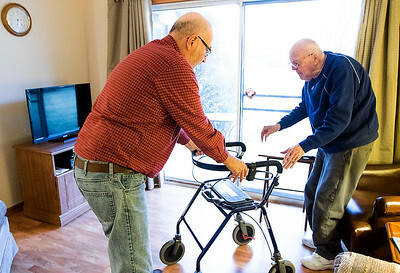 Sarah Nader- snader@shawmedia.com Bob Maronda (left) helps his 90-year-old father, Bob Maronda, walk over to the kitchen for dinner while visiting his dad at his Crystal Lake home Wednesday, March 18, 2015. Sarah Nader- snader@shawmedia.com Bob Maronda (right) visits with his father, Bob Maronda, while he eats dinner at his Crystal Lake home Wednesday, March 18, 2015. With the help of family and caregivers Maronda takes care of his 90-year-old father who has parkinson’s disease. 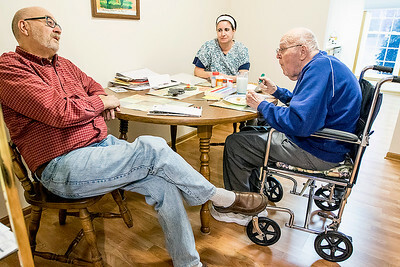 Bob Maronda (left) visits with his father, Bob Maronda, and his fathers caregiver Terry Copack while he dad eats dinner at his Crystal Lake home Wednesday, March 18, 2015. With the help of family and caregivers Maronda takes care of his 90-year-old father who has parkinson’s disease.